Worst Case by James Patterson and Michael Ledwidge is the third book in the Michael Bennett detective series. Readers will not have to read the other two books in the series to follow along as this New York Detective takes on a child kidnapper with a social agenda. Bennett is a single father with 10 children — not all of them biological — whose holy grandfather Seamus and nanny Mary Catherine make his life a little less hectic and in some cases even more so. Bennett must not only balance his fatherly duties with detective work, but also must learn to separate the cases he works on as part of major crimes. 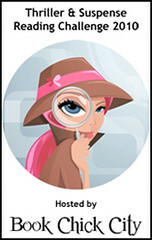 New York is an excellent location for this detective, with its high crime boroughs and its high class residents. Worst Case is narrated superbly by three narrators, Bobby Cannavale, Orlagh Cassidy, and John Glover as each voice takes on either Bennett, FBI child kidnapping expert Emily Parker, or the serial murderer. “Without pausing, he veered to my left, bounded up onto the low iron railing, and dove without a sound off the bridge. Readers will enjoy the fast paced, short chapters with their clipped sentences as tension builds and Bennett runs in circles around the city at the behest of the killer. The narrators of the audio pulled off the New York and Virginia accents as they read through the book, although the sound effects of gun shots and other items were a bit disturbing, especially when driving late a night on dark highways. Worst Case is another sign that this series about Michael Bennett is just heating up. Another suspenseful winner. This is my 11th book for the 2010 Thriller & Suspense Reading Challenge. While I attend some great panels and meet some authors and publishers in New York City this week, I didn’t want to leave my readers high and dry for reviews. My mom, Pat, has supplied me with enough reviews to get you through until my return. Please give her a warm welcome. James Patterson and Michael Ledwidge’s Worst Case is another in the Michael Bennett detective series set in New York. In this novel, a son of one of New York’s wealthy elite is kidnapped off the street and held hostage. The twist is that the parents do not have a ransom demand to meet and the prospects of saving their son appear grim. The killer seems to like playing games with his victims and their families, quizzing the kidnapped victim and killing them if the answers they give are incorrect. Bennett must follow the clues left for him to solve the case. However, one kidnap victim was smarter than the others and she answers all the questions correctly. Surprisingly, she is freed. Patterson does a great job leaving the killer a mystery; the last person readers would suspect is the killer. Another fast read with spell-binding action. Five stars. Thanks to Hachette for sending along a free copy of Worst Case for review. 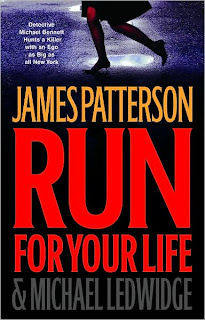 James Patterson and Michael Ledwidge’s Run for Your Life is another in the Michael Bennett crime drama series. My mom, Pat, will be your guest reviewer today, please give her a warm welcome. Run for Your Life chronicles another adventure of Michael Bennett, a detective in the New York Police Department who is a single father to 10 children. In this novel, a murderer who calls himself “the Teacher” takes New York City by storm, slaughtering the powerful and arrogant rich people of the city. “The Teacher” selects his victims from those he meets. Michael Bennett races across the city to investigate these vicious crime scenes, and many of these are difficult to visit. While “the Teacher’s” rampage across the city continues, Det. Bennett’s children fall ill with the flu, making his job even more difficult. Run for Your Life is another page turner that readers will be unable to put down. Another five-star crime drama from James Patterson, chock full of action. Thanks, Mom, for another detailed review. Look forward to more from her later this week.